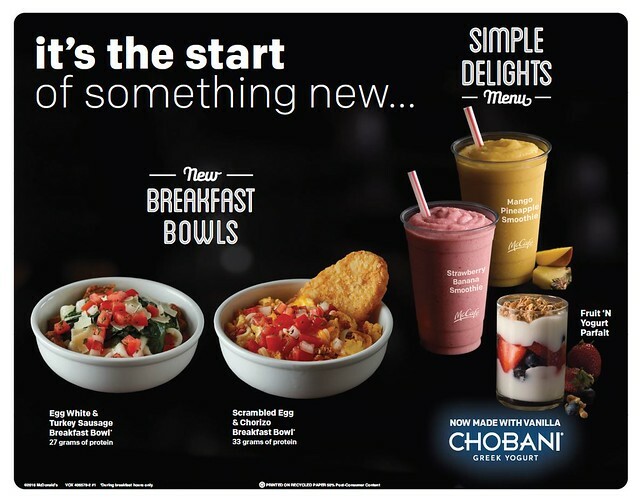 LOS ANGELES (March 1, 2016) – Responding to customer interest for more variety and premium flavors, Southern California restaurants are now offering Breakfast Bowls and Chobani® Greek Yogurt in its parfaits and McCafé Smoothies. Egg White & Turkey Sausage Bowl: This 250-calorie meal, with 27 grams of protein, features breakfast turkey sausage, egg whites, sautéed baby spinach and kale, topped with thin shavings of Parmesan cheese and a freshly prepared bruschetta. Scrambled Egg & Chorizo Bowl: Step outside your comfort zone with the bold flavors of crispy hash browns, fluffy scrambled eggs mixed with savory chorizo, topped with shredded cheddar and jack cheese with freshly prepared pico de gallo and spicy roasted salsa roja on the side. Additionally, McDonald’s Fruit ‘N Yogurt Parfait and McCafé Smoothies are now made with Chobani Non-Fat Vanilla Greek Yogurt offering customers more choices. The smoothies and parfaits will be on the new Simple Delights menu, which provides balanced options for McDonald’s customers. . Participating Southern California McDonald’s restaurants will offer McCafé Smoothies and Fruit ‘N Yogurt Parfaits made with Chobani Greek Yogurt all day. Breakfast Bowls will be available during normal breakfast hours and priced at $4.39. For full nutrition or ingredient information and additional details about the breakfast bowls and new Chobani offerings visit www.McDonalds.com. Guest can also download the McDonald’s mobile app and follow us on Twitter @McDonalds_SoCal for all the latest deals and offers in our restaurants. The McDonald’s Operators’ Association of Southern California (MOASC) is comprised of more than 600 franchised and company-owned McDonald’s restaurants in Los Angeles, Orange, Riverside, San Bernardino and Ventura counties. Follow us on Twitter: @McDonalds_SoCal.